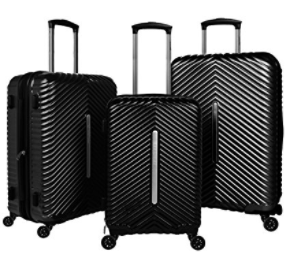 Cheergo PC Hardside Luggage Set is made up of three expandable spinner trolley suitcases of 20, 24 and 28 inches for your varying needs on different types and lengths of travel. You have three color options to choose from, black, silver and red with the same price tags at the time of this review. And by getting a color other than black, you will be able to find your luggage easier on the airport carousel. But you should be OK with black too in that sense because the design is quite unique with the brushed metal surface with an elegant pattern as you can see in the photos. The exterior is made of the rather firm, strong, tough and super light German Bayer PC- Polycarbonate and ABS hard shell material. So your suitcases will prove durable over time despite the rough treatment by the airline staff. These bags offer a decent amount of storage for their external dimensions. 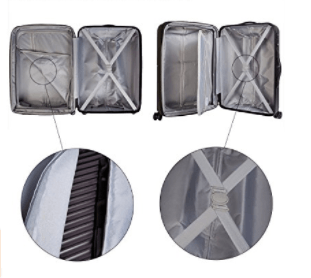 And they are expandable by opening the zippers through the middle so you have even more packing space. They come with the durable and adjustable three step aluminum sticks- telescoping handles, as well as the comfy to hold side and top handles. Solid multi-directional double airplane spinner wheels under each bag ensure 360-degree smooth, silent and easy movement on the airport terminal grounds. So you can easily maneuver the bags in very tight spaces. The smallest 20-inch bag can be used as a cabin bag that you can take to the plane. You need to check in the 24 and 28-inch suitcases. It is nice having three different sizes for your different travel needs. The three-digit combination locks are TSA approved on all three bags and can be opened by the TSA staff at the airport for inspection without having to break the lock. The quality seems really good with the durable hard shell exterior and good quality internal and external components. You have the zipped pockets on one side and cross straps on the other side to help you organize your belongings better. The brushed metal surface is built with the metal grinding process, looks good (Italian design) and helps prevent scratches, scuffs, and marks. The 20-inch bag measures 23.22 x 15.74 x 9.44 inches, the 24-inch medium suitcase is 26.7 x 15.74 x 9.44 inches and the 28-inch suitcase has the dimensions of 30.70 x 15.74 x 9.44 inches including the wheels but not the telescoping handles. You have the German PC and ABS combination of the hard shell that is flexible to absorb impact when under stress and a variety of other features.This is a reliable, functional, solid and durable, flexible and comfortable set of three bags that you can have a peace of mind with. Lifetime warranty is offered on the Cheergo PC Hardside Luggage Set.